There could be a number of answers as to why Butler has taken some of the heat from the fans this year. The obvious answer off the top is he is not having the type of year he had in 2012. I had a feeling this would happen, as Billy had his best season last year and put up power numbers that he had never put up before. For years, people have felt like he should hit for more power, and last year they got it. Go ahead, it’s easy to compare the numbers. For a fan who just looks at the base numbers, Butler is under-producing and his numbers appear to be down. But if you take a closer look, a lot of the numbers are actually on par or even better than he has had in the past. His OBP is tied for his career high(heavily helped by his career high in walks. Yes, walks do matter!! ), his OPS+ is the third highest of his career, and his total bases isn’t too far off from his career average. Now, with all that being said, this is a down year for Butler, and the numbers show that as well. I hate to even bring up the other thing that Butler catches flak for, but it’s true. The fact that Billy isn’t a lean-mean-home run hitting machine gets thrown around quite a bit over the years. I mean, there is a reason he got the nickname “Country Breakfast”. I’m not for sure why people are so worried about his weight and how that plays into things. I could see it if it affected his hitting, but like we’ve pointed out, it’s not like he is at Francoeur-levels. In fact, history has shown that heftier players seem to do fine. Anyone hear of that Babe Ruth guy? He’s just one of the greatest players in baseball history. Boog Powell was a little hefty, and he was a hell of a slugger. Prince Fielder seems to do fine. Bob Horner was quite the power hitter back in his day. Kirby Puckett? Hall of Famer. So history shows that some extra weight isn’t a detriment. But it does play into all of this. 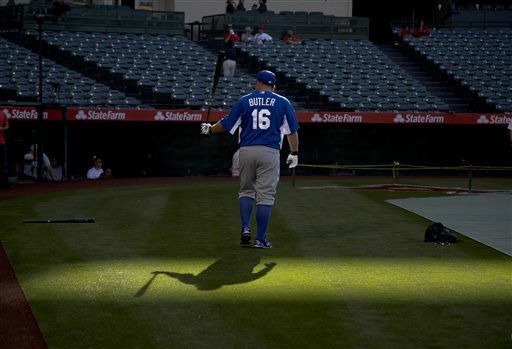 Billy Butler’s weight I really feel is where some of the anger comes from. For one, it’s easier to pick on the fat kid. Don’t even act like that doesn’t happen, or you have never done it. Second, there is a belief that a guy his size should hit more home runs, or at least that is what most casual fans would tell you. The problem is that what makes Billy a better all around hitter is that he isn’t a power hitter. Billy’s career high in strikeouts was last year, which goes along with the increase in power. Now, I know in 2013 strikeouts aren’t frowned upon as much as they used to be, but they should be. I would take the guy who is a great hitter and doesn’t strike out much over the guy who hits a lot of home runs and strikes out all the time. I actually heard someone last week say they would rather have an Adam Dunn-type over Butler. Seriously? No way is Dunn or a Dunn-type player better than Billy. Ever. I’ve always felt Butler was more of a gap hitter, which holds up if you look at his doubles numbers over the years. Butler is more a John Kruk than a Boog Powell. Kruk was a great hitter, a career .300 hitter, and was a little overweight. He didn’t hit for much power though, and Billy is in that same category. In some ways, Butler will always catch crap from fans unless he goes out there and hits thirty homers every year. It’s not fair, and not the player he actually is, but it’s a fact of life. So one last time, I want you to look at Billy’s numbers this year. I fully acknowledge that he isn’t putting up quite the numbers he had last year, but there is a good chance 2012 will end up being his career year. If you go up and down the Royals roster, I’m sure we can all find flaws in all of these guys. None of them are perfect. But there are certain flaws you can live with, and others that end up costing a player his job. Billy has done nothing but hit over his seven year career, and his .295 average this year is just one telltale sign that he hasn’t having as bad a season as some think. Of all the players on this team, I’m pretty sure Butler should be one of the last ones we should be tearing down. The guy wants to end his career in Kansas City, although you wonder why with how some fans have been acting. 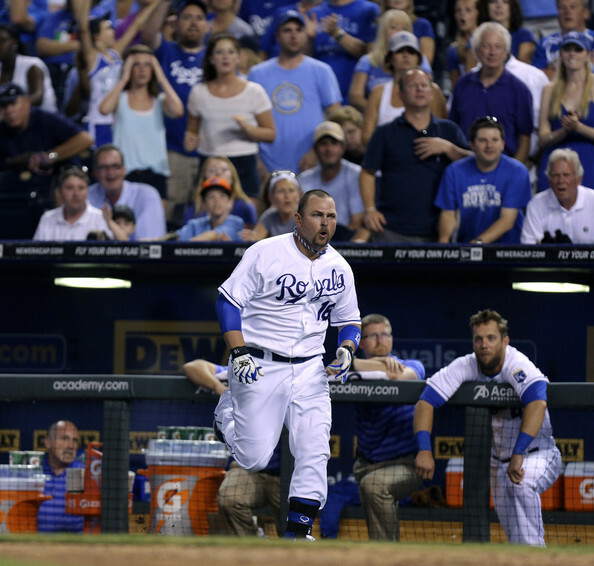 At the end of the day, Billy Butler is not the problem with the Royals. Maybe he should be appreciated and lauded for being one of their best players instead of treated like he is Jeff Francoeur. 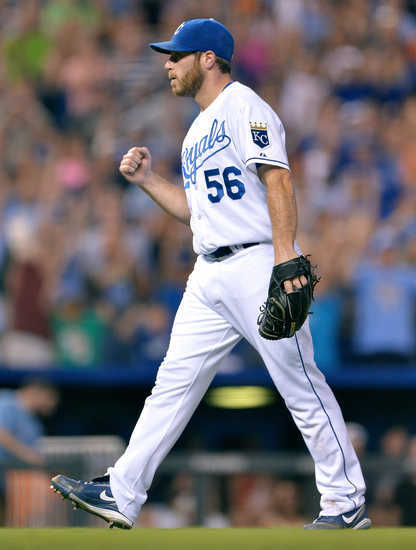 Maybe some Royals fans should remember why they were cheering him like crazy just a little over a year ago. It sure feels like forever since the Kansas City Royals had their long winning streak and were one of the hottest teams in baseball. Remember when there was all that talk about the Royals making a push for the playoffs? Remember the talk about whether we should order our tickets now or wait until tomorrow? Remember when we started planning the parade? It only takes a few weeks to kill all those hopes, as the Royals seem to be on the downside of the roller coaster we call the 2013 season. Sure, we kind of figured the Royals would lose the series to Detroit a little over a week ago. But none of us saw Kansas City getting swept by Chicago, and just how bad the Royals would look against the Pale Hoes. The offense apparently is on vacation again, and it seems at this point that as it goes, so goes the Royals as a team. So, with just a bit over a month left in the season, there are a few questions to pose. 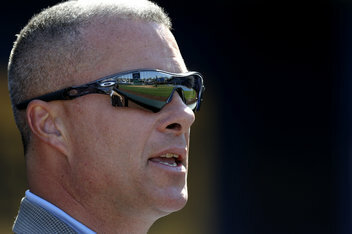 1) Should Dayton Moore and Ned Yost be fired? The easy answer to this is yes. Dayton has had seven years to put together a winning team in Kansas City, and at this point not even .500 is guaranteed this season. Moore bargained the future to reach the playoffs sometime in the next few years, and with Shields gone after next year, the clock is ticking. That being said, I think Moore will be back, and could possibly gain an extension. I don’t feel like he deserves it, but I’m not the one running the team. Now, when it comes to Yost it gets even more interesting. With the way the last few weeks have gone, Neddy sounds more and more like a beaten man and someone who isn’t for sure he wants to continue managing. Yost’s contract runs out at the end of the year, and with that in mind I wonder if he won’t get fired. Instead, I can see him going back to his front office job and let the Royals go after their next manager. That way, he doesn’t get fired, he can stay in the organization and not have to deal with the headaches of managing that obviously seem to bother him. If this is the case, I imagine guys like Vance Wilson and Pedro Grifol will be heralded as his replacement, or they could go after a proven manager, such as a Charlie Manuel or a Mike Scioscia(if he is available; yes, he is my dream manager! )Either way, I don’t picture Neddaniel being around next year. 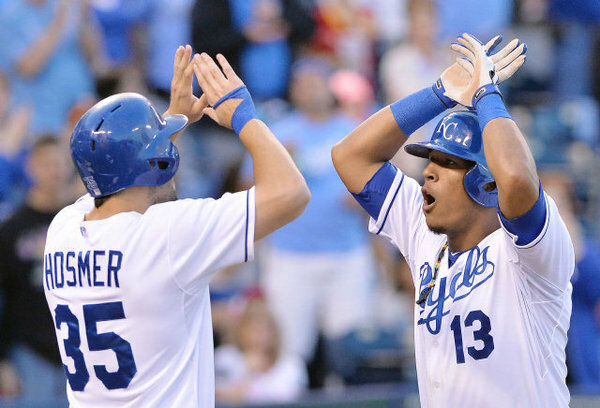 2) What do the Royals need to go after in the off season? In a very un-ironic way, they need the same things they needed last off season; starting pitching, a second baseman and a right fielder. The difference between this year and last year is that Dayton didn’t see a need for two of those things, and how did that turn out? 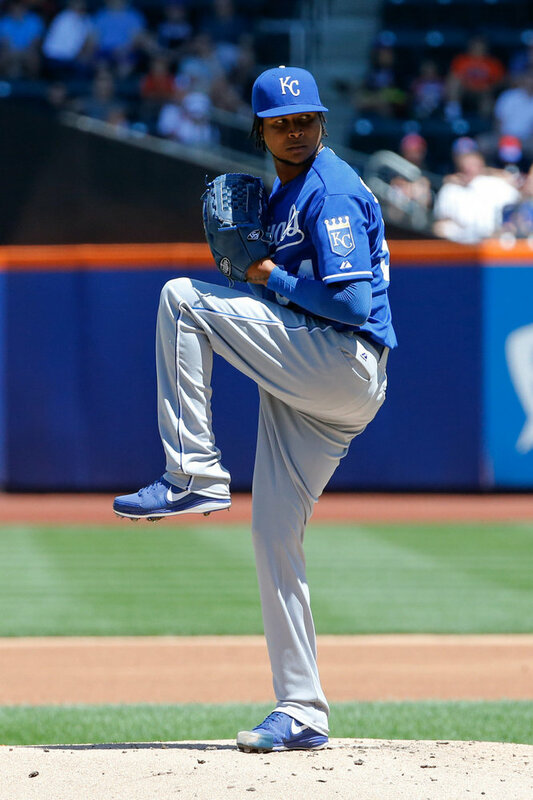 More than likely they will have to find someone to replace Ervin Santana’s rotation spot, as I have to believe someone will offer him more money and years. It would actually be wise to maybe stock up on two arms, which can be done even if financially they try to be frugal. Chris Getz has never been the answer at second, which has been extra evident this year and as much as I like watching David Lough play, I’m not 100% sure he is the answer in right field. Same goes for Justin Maxwell. 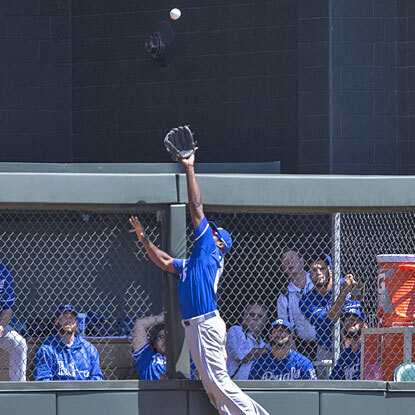 Since the Royals need some power in the lineup, right field would be a good spot to look for some pop. I know the Royals only have so much money to use, but with a number of players coming off the books (Chen, Francoeur, etc.) and the money they will get from the new MLB TV deal, they should be able to fill these holes and do it within budget. 3) Has the 2013 season been a success? What I am about to reveal isn’t really a big secret. 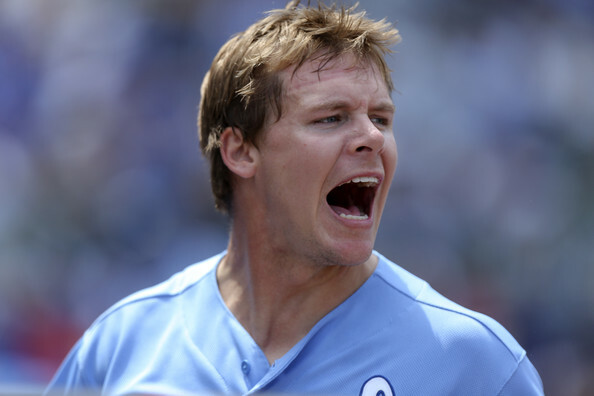 In fact, most know this: I hate Chris Getz. Not the person, mind you. I don’t know the person. 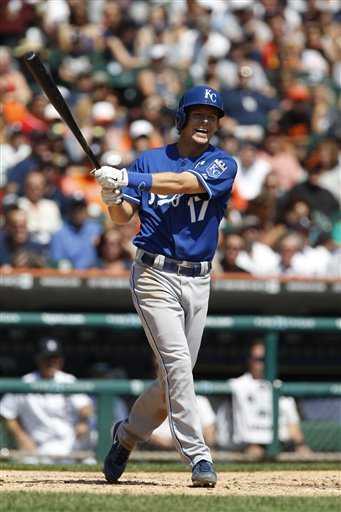 But Chris Getz, the ballplayer, I absolutely loathe. We are in year four of the “Coaches Son” being a fairly regular part of the Royals lineup and after this past week I just can’t stomach seeing him continue to play ball. 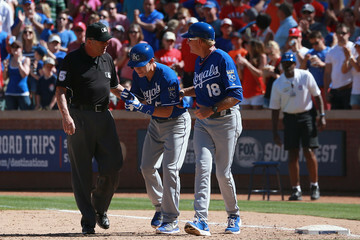 If it wasn’t obvious before, I’ll flat out state it now; Chris Getz needs to go. Before we go any farther, I should mention that I’ve always wanted him gone, but what is going on now is different. What is going on now is blame falling on him, where as before it really wasn’t. You see, before I never really laid blame on him as much as Kansas City Royals management. Sure, I didn’t think Getz deserved to even be on the major league roster, but I knew this was more the fault of Dayton Moore and Ned Yost for valuing the wrong things about their players. 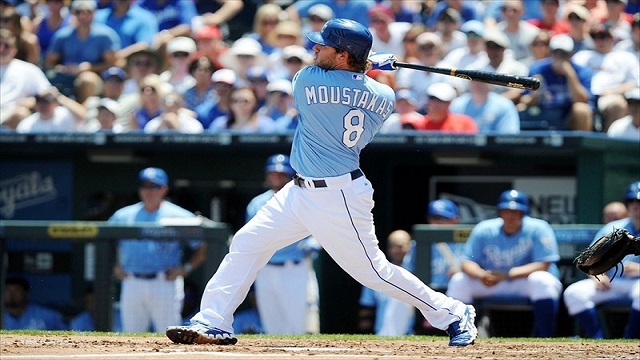 Hey, when you emphasize bunting as much as Yost does, you obviously have your head planted in the wrong place. So before this season, it always felt more like Moore & Yost were to blame for Getz’s faults, not actually Chris. I might be the president of the ‘I hate Chris Getz’ fan club, but even I could see that. But now the blame heads closer to home. Sure, management still loves ‘Getzie’, but now he is proving them wrong. You see, Moore and Yost have always praised Chris for the ‘little things’ he does. Seriously, guys, I can’t make this up. They have basically said they love that Chris bunts, plays great defense, moves runners over, dinks balls over the infield and is a good base runner. These are all things they have praised him for in the past. In fact, Moore once referred to him as “mistake free”. That’s how #MistakeFree started whenever Getz would flub something up. Hey, I can be fair enough to say that isn’t Chris’s fault that Moore paints that picture of him. That is on them for praising a guy who should just be happy he has a major league job. But we are on year four of Getz getting regular playing time and nothing has changed. He still can’t hardly reach the warning track, despite that one “GetzBomb” earlier this year in Atlanta. He isn’t “great” on defense like Dayton says; he is average. He still bunts more than any human should. Getz is the definition of average; he does nothing great, but everything just good enough to get by. Look, I know the cartoonist wants to have Getzie’s babies, but that’s like that one guy you work with(that everyone hates) praising ‘According to Jim’ because it aired for 8 seasons. Back to the point; Getz is that player who toils in the majors for a few years before trying to hang on in AAA for awhile before teams just quit giving him a look…except the Royals keep sticking this guy back at second base. Do these numbers really deserve to equal playing time? Not when his very few positives start becoming negatives. 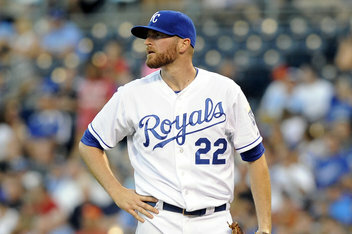 Just within the past week, two of his “positives” end up screwing the Royals over. 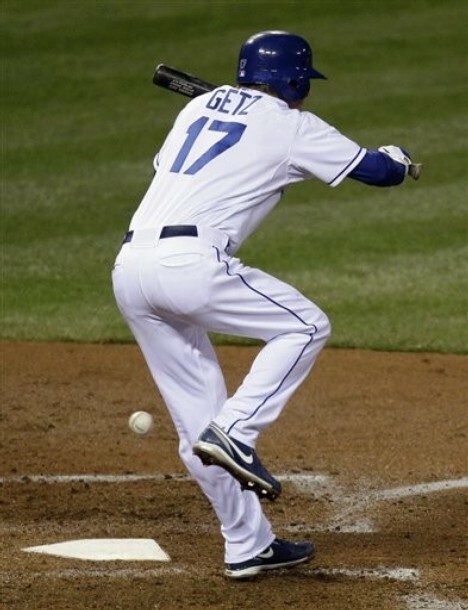 On Tuesday night, Getz was picked off of first base, at least the third time that has happened over the last month. Then, on Friday night Getz had a ball hit to him with the bases loaded, goes to throw it home and completely misses catcher Salvador Perez. Yost tried to spin it in postgame that Getz had to run and throw it, but the ball was hit right to him. It was just a crap throw in a crucial part of the game. Now, I’m not saying the guy can never make a mistake, far from it. But this has been a small synopsis of his entire season. For all the talk about Getz being great defensively and being a good baserunner, he showed this week he is what I have always said he is; average. You could make the excuse of Getz getting playing time if Kansas City had no one else available to play second base, but they actually have options. No matter what management tells you, Johnny Giavotella IS an option. Hey, maybe if they had actually given him a real chance this year, instead of 10 games and 38 plate appearances, maybe, just maybe, he would have produced even just slightly more than Getz has, which really isn’t much. Irving Falu has been available all year, and though I don’t think he is more than a backup, he could have outperformed Getz. Anthony Seratelli is still in Omaha and could be the Royals version of Matt Carpenter of the Cardinals, if given a chance. Hell, Christian Colon has been tearing up AAA pitching the last couple months, yet not even a hint of a call up. At the end of the day, Royals management is telling us they would rather have “Joe Average” trot out to second 4-5 times a week then see if any of the players in AAA could top his putrid .224 average and his less than stellar output. After four years of this crap, it’s time to just cut the chord. Four years ago, Chris Getz was part of the trade that sent Mark Teahen to the White Sox. 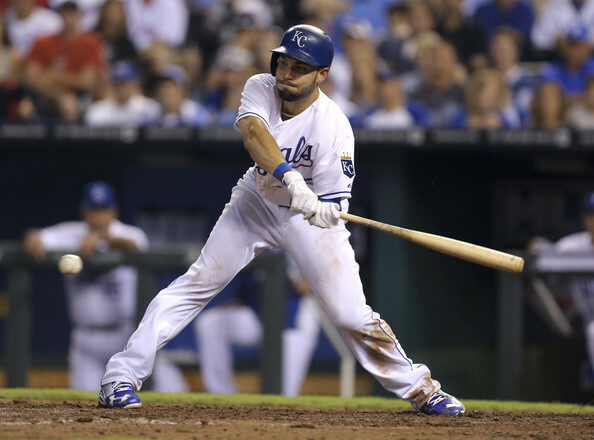 Teahen was the last of the Carlos Beltran deal from years past, so in effect Getz is the last of the Beltran trade that netted the Royals not much of anything. it’s been obvious for years that the Royals have a giant, Frank White-like hole at second base, and Getz isn’t and never has been the answer. A few years ago, when it seemed that Giavotella might actually get a real shot(sounds funny now, eh? 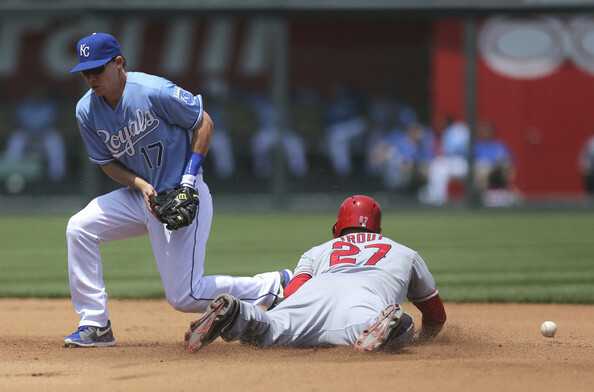 ), I said that what we had seen up to that point was all we would see from Chris Getz. In other terms, he is what he is. I sit here now, still knowing that Getz is what he is, and in some ways is even less than he was two years ago. 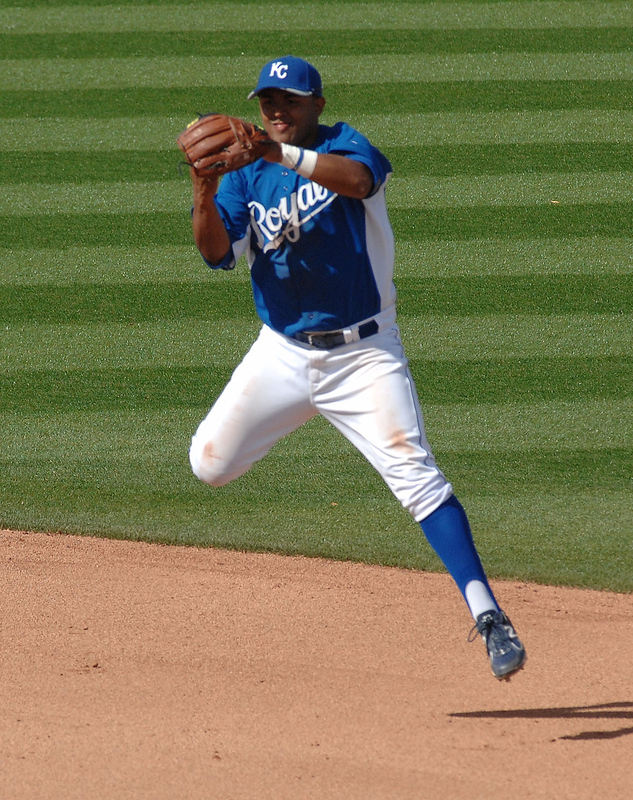 Sure, I love writing ‘Questions with Getzie’, but I’m to the point where I would rather the Royals have a real second baseman instead of having to make fun of the one who is currently in that spot. If the Royals are serious about contending in 2014, Getz needs to be gone. If not, expect more of the same thing. Dayton and Ned, it’s time. It’s time to let your bunting golden boy go off into that baseball pasture in the sky. Or just release him. Death might be a bit extreme, even for me. The one constant in baseball is change…well, that and the Pirates will continue having losing seasons. Wait, what? The Pirates are in first place? But it’s August! Anyway, back to change. Change is inevitable, especially when it comes to the manager’s job in Major League Baseball. As of last week, no manager had been fired during the 2013 campaign. That was until Friday, as former Phillies manager Charlie Manuel denies he quit or resigned. That leaves the only other option, fired. 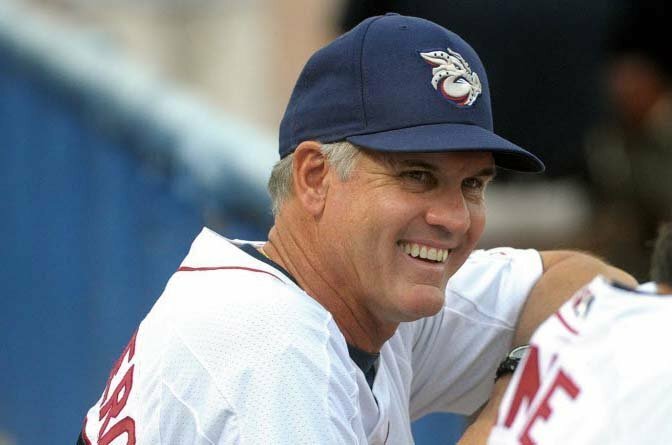 Taking his spot in Philadelphia is their third base coach, Ryne Sandberg. Yes, former Chicago Cub and baseball Hall of Famer Ryne Sandberg. It was long thought that Sandberg would be Manuel’s replacement once he stepped down, so no big shock in that regard. Sandberg has been spending the last six years managing in the minor leagues, building his resume and hoping for a future managerial job in the majors. 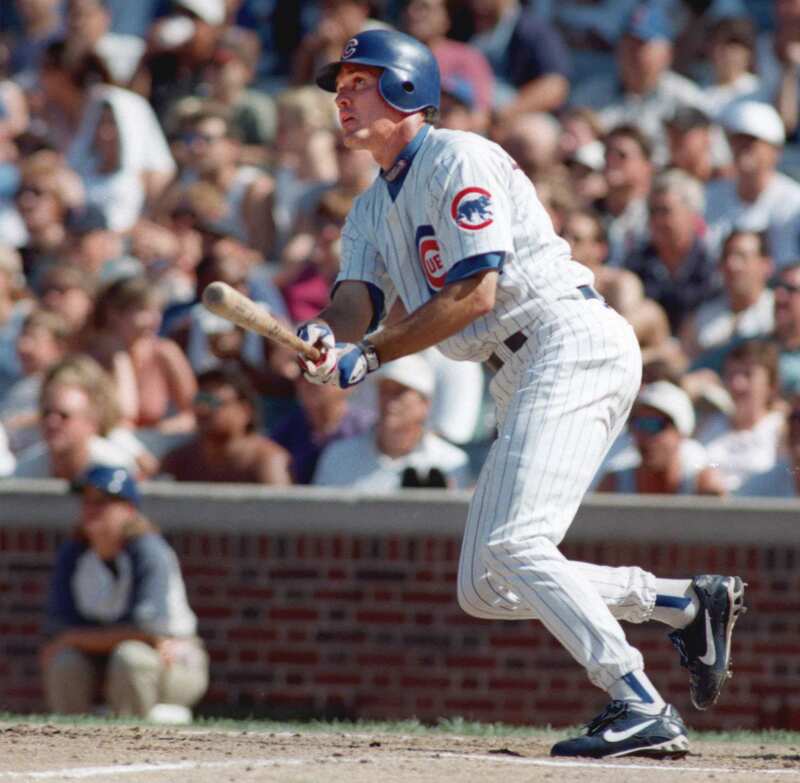 In fact, Sandberg had honed his chops in the Cubs system, working his way up from A-Ball to AAA before it was all said and done. The Cubs passed Sandberg over for their major league job, despite many fans and experts feeling like he deserved the spot. 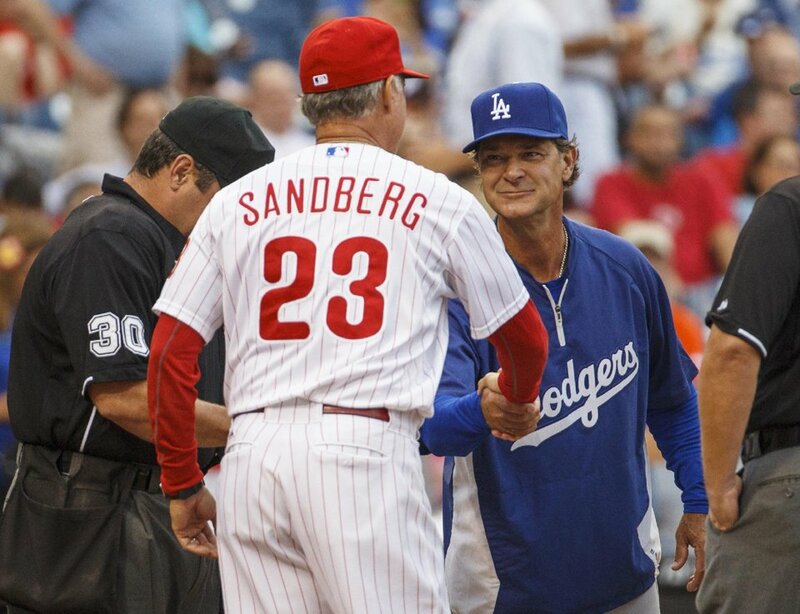 Sandberg took his talents to the Phillies. Oh, the irony. You see, Sandberg was originally drafted by Philadelphia and was eventually traded to the Cubs with Larry Bowa for shortstop Ivan DeJesus. For years, the Phillies kicked themselves for that trade, but would be able to save some face if Sandberg could be a successful manager in the big leagues for them. The big question is whether or not he will be a good major league manager. You see, throughout the history of the game, very few Hall of Famers ever turned out to be great managers after their career was over. In fact, only four Hall of Famers who managed posted a winning percentage over .500. Most fail and fail so badly they never manage again. Take Ted Williams. “Teddy Baseball” is one of the greatest baseball players ever, and some like myself consider him the greatest hitter in baseball history. But Williams ran into a huge problem when he went to manage; he expected his players to be as good as he was. 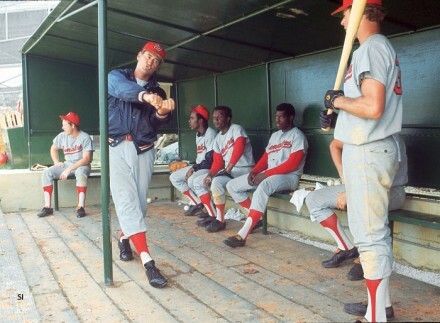 Very few can even get close to having the ability Williams had, so of course his unrealistic expectations for his team led to him having a .429 winning percentage from 1969-1971. So Sandberg has a steep mountain to climb, but from all accounts it seems he’ll be fine. He has long been highly regarded as a strong managerial candidate and one of the main positives heard about Ryno was his ability to get veterans and youngsters to work together and try to reach the same goal. Many of the veterans he managed at AAA mentioned how good a job he did working with every player and not letting anyone feel left out. All the glowing praise piled on Sandberg made me want him as the Royals manager whenever they finally decided to let Ned Yost go. I knew it probably wouldn’t happen and was a long shot, but a guy can dream, right? 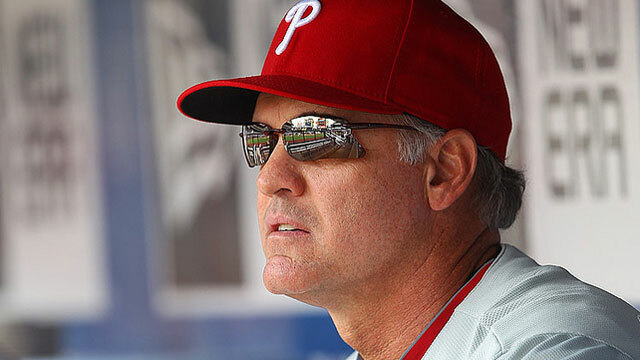 Ryno is technically only an interim manager at this point for Philadelphia, but if he does a solid enough job over the next six weeks, it seems the Phillies job is his to hold next year. I’m glad to see Sandberg finally getting his deserved shot at managing a big league ball club and wish him all the success in the world. Still, it would have been nice to see him in Royal blue. For the Love of God, Stop Bunting! 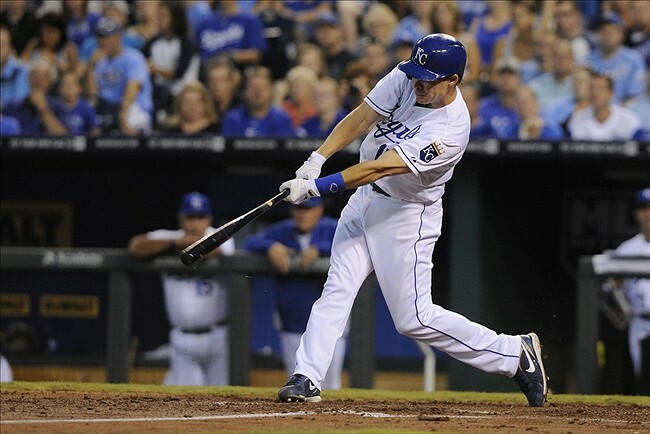 Last night, the Kansas City Royals encountered a tough loss to division rivals, the Detroit Tigers. It was a back and forth game between the two ball clubs that saw the Royals leave a bunch of runners on base and ended with the best hitter in baseball, Miguel Cabrera, take Aaron Crow deep in the 9th inning to win the game. Some Royals fans were outraged that Crow pitched to Cabrera instead of intentionally walking him. I was more outraged that the Royals bunted during the top of the inning with two outs and a runner on third. 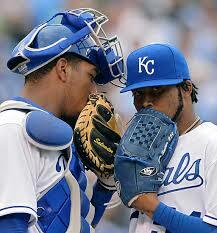 How many remember the 2010 Kansas City Royals? If you do, you remember that they didn’t have much punch on that team. That team had Billy Butler, Jose Guillen…and…and…well, Yuniesky Betancourt was tied for the team lead in RBI’s-with 78. This was also a team with Scott Podsednik and David DeJesus at the top of the lineup, so if this team relied a bit more on small ball, that was fine. The honest truth was that team probably wasn’t going to score much if not for small ball. It was fun watching this team built more around speed work that speed to their advantage and have a very good April, before they fell off the map later on in May. For that team, it made a bit more sense to use bunting as a weapon. But the last two years? Absolutely no reason to use it at all. Now, there are a few times that bunting is acceptable and even the best course of action to take, but for the most part it isn’t, and the numbers prove it. If you are in the bottom of the eighth or ninth, and really only need one run, and you have a runner on first with no outs, a sacrifice bunt is acceptable. In fact the percentage chance of scoring one run actually goes up in that case. But if you aren’t playing for one run(and let’s be honest, you rarely should be), this is an awful choice, as your run expectancy goes down. Don’t believe me? Read here. For the most part, you should always be playing for more than one run, as only a fool thinks you should stop at one if you have a chance at more. Letting the batter go ahead and hit makes your chance of scoring go up and give you an opportunity to put more runs on the board. There is nothing more frustrating to me than seeing the Royals bunting…IN THE FIRST INNING!!! Everytime it happens, all I can think of is former Orioles manager Earl Weaver. Weaver once said “If you play for one run, that’s all you’ll get”. It might not be like that 100% of the time, but if you look it up, Weaver is right. Playing for one run just seems like a flawed theory and an easy way to have your team playing from behind. 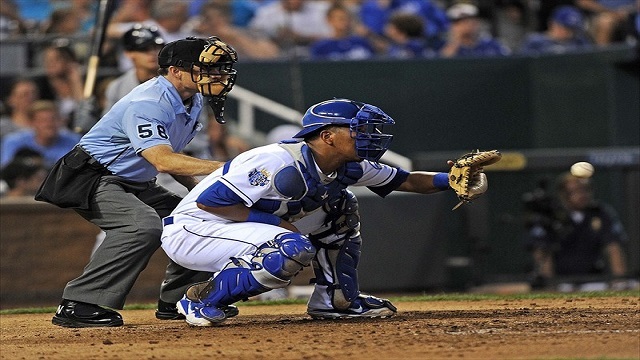 There is one exception in my mind for bunting: if Royals outfielder Jarrod Dyson wants to bunt, you let him. Hell, at times you force him to bunt. Dyson has ridiculous speed. Like ‘Herb Washington only pinch runs because he is a world-class sprinter’ type speed. There are certain players in the game that can use their speed as a weapon, and Dyson is one of them. He has game changing speed. Dyson is a guy who can bunt for a hit and even if the infield is in, will probably get it. So in this situation, I am fine with bunting. A speedster like Dyson can completely change the game plan of the other team or even worse for them, wreak havoc on a fragile pitchers psyche. 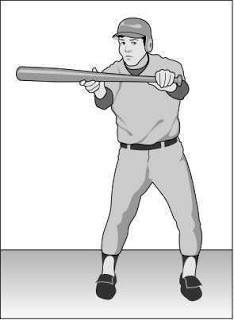 In this scenario, let him bunt. Unfortunately, the Royals don’t seem to use their bunting in correct or even logical situations. 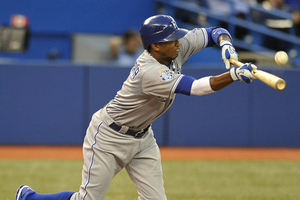 Alcides Escobar is guilty, especially when he was batting second, of bunting in the first inning. 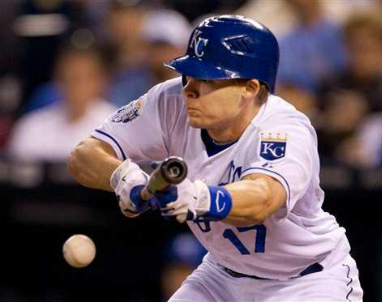 Second Baseman Chris Getz can barely get the ball to the outfield sometimes, so bunting is a big part of his game, and not always when he really should. I would like to say here that it is just a situation of the team not having guys who are good hitters, but it goes deeper than that. This organization loves bunting. The manager and the GM are on the same page, both heaping high praise on the players who bring bunting into the game. Well, unless you are Escobar. Then sometimes Neddaniel will throw you under the bus. But for the most part, they applaud the use of the bunt, and that is just as big a problem as the player who goes out there and thinks it gives them a better chance of scoring then standing in the box and actually trying to hit the ball. So, are there times that bunting is not only acceptable, but should be expected? Of course. But for the majority of time, it should probably be discouraged and left for only certain situations or for certain players. I know the bunt used to be a big part of the game years ago, but the game is in a constant flux of change, and will for the rest of eternity. The numbers don’t lie and show that bunting actually hurts your team’s chances of putting runs on the board. 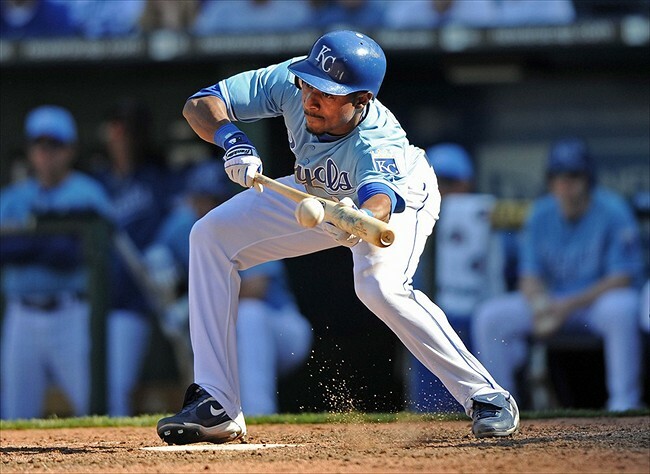 The Kansas City Royals, a team that can’t allow for many mistakes, would be wise to learn a proper time to use the bunt and when it is detrimental. Bunting with two outs in the 9th and a runner on third? Not the right time. When that happens, a loss shouldn’t be a shock. I can only hope the Royals learn this lesson before it hurts them during a crucial time, like making a playoff push. 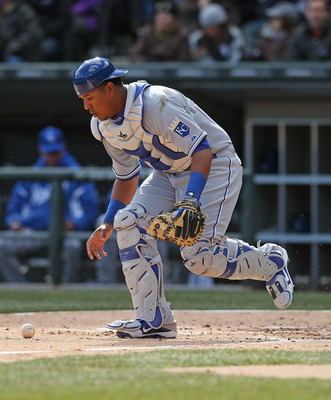 As most Kansas City Royals fans will tell you, catcher Salvador Perez is a special player. He isn’t just special because of his great throwing ability, or solid bat. He is a leader to the pitching staff and I have yet to hear one pitcher say they disliked throwing to him. In fact, almost every pitcher to a ‘T’ has said they love throwing to Salvy. Perez is loved by his entire team and helps loosen up the mood in Kansas City’s dugout. So when people throw names like Bench and Molina around when comparing Perez to someone, it isn’t just rose colored glasses or fan lust. But there is one thing that concerns me about our possible perennial All-Star, and it has nothing to do with anything Salvy himself does. No, what concerns me is how Perez never seems to get a full day off behind the dish. 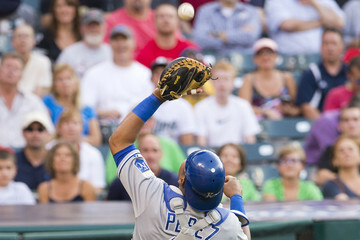 Even in games where George Kottaras starts in his place, before that game is over with, Perez is back behind the plate. This concerns me to no end. Before we start, I’ve heard the arguments, and I get where some people are coming from. Perez is only 23. His only major injury was last year’s meniscus tear in his knee, which held him out for the first couple months of the season. You could probably also throw in there the concussion Perez encountered just a few weeks ago(and I do consider concussions very serious). 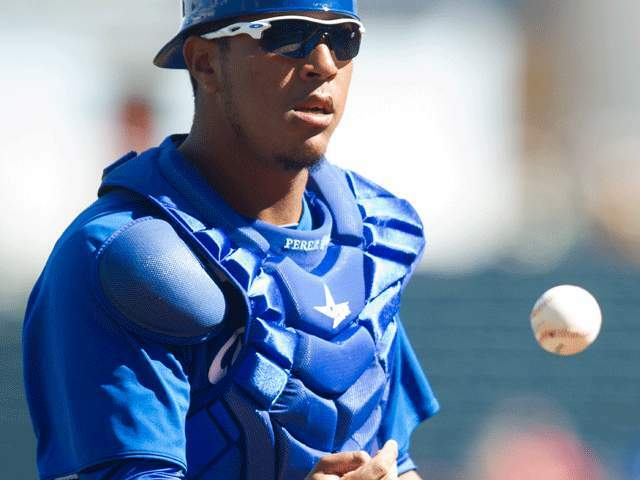 Overall, Salvy has encountered very little wear and tear on him and is young enough to where it will probably be awhile before he shows the affects of crouching behind the plate for a 162 game season. But the point isn’t that he should be fine for the immediate future. No, what concerns me is where it puts him in about 5-6 years. There is a thinking in baseball that catchers shouldn’t be tall and lanky. In fact, only 11 catchers over 6’4 in MLB history have ever accumulated 2,000 career at bats. The most high profile on this list is Minnesota’s Joe Mauer, who is a two-time batting champ and an exceptional hitter. Perez is only 6’3, but in my eyes that is close enough. The general thinking is that tall catchers don’t last because they encounter more injuries, especially in their knees, than smaller, squattier(I know, not a word. Consider this me making a new word) players who wear the tools of ignorance. Mauer is the perfect case of that, as his injuries over the years have made it to where the Twins have started playing him at first base. Minnesota knows that at some point, they will probably have to move Mauer to another position to keep his bat in the lineup. He wouldn’t be the first. Carlton Fisk had a stint in the outfield late in his career, even though it didn’t really stick. Johnny Bench was moved around, playing some third base, first base and even the outfield. These are elite catchers in the pantheon of the game, the best of the best and they were forced to move away from being a full time catcher. So history shows where Perez’s future could lie. Knowing all of this now, I bring the question back up: why is Ned Yost insisting on putting Perez into every single game behind the plate? I get that Perez is better defensively than backup George Kottaras. Kottaras is known to call a good game, but arm wise it’s not even close. Same for blocking pitches in the dirt. Like I said, Perez is just a really special ballplayer in that regard. I firmly believe that a lot of the reasoning Yost has for bringing Perez in late in the games he doesn’t start is for his defense and to hold a lead. Trust me, I get the thinking. But is it really worth it? Kottaras is probably one of the best backup catchers in the game, as he has the uncanny talent of basically being a ‘I’m either going to collect a walk here or hit a home run’ kind of player. His OPS this year is ridiculous for a guy hitting below .200. 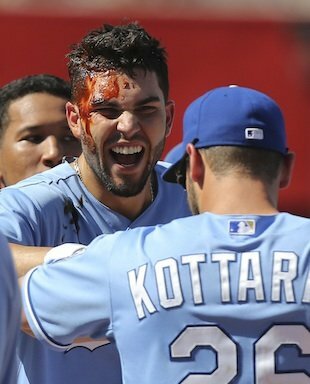 Really the only reason to take Kottaras out of the game is to have a better arm behind the plate. Like I said, I get the reasoning, but I don’t agree with it. The perfect example of why I don’t agree with it happened a few weeks ago in a game against the New York Mets. Perez was brought in late in the game as a defensive replacement, and proceeded to catch a foul ball off his mask, causing a concussion. Now, I am fully aware that this could have happened at anytime, or any game. It’s part of the danger of being a major league catcher. But once again, Kottaras could have still been in the game, as there was really no reason to bring Perez in. If I had a choice, I would rather lose Kottaras for a few games than Perez. 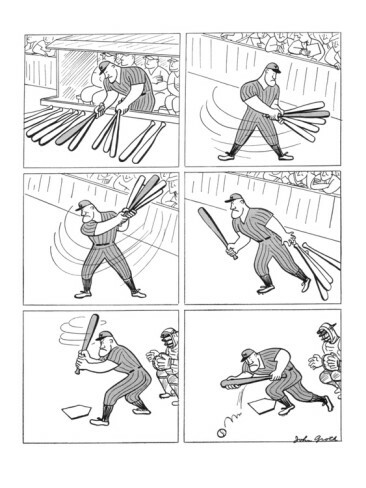 What if the concussion had held him out longer than the seven games used for concussions in baseball? Just look at someone like Justin Morneau, and how long it took him to come back from his concussion. It would seem that the more a player is in the game, the higher percentage of him getting hurt goes up. That is obvious. Perez so far this year has appeared in 95 games, 87 that he has started. He also missed time earlier in the year, as his grandmother had passed away. Perez was gone for nine games during his leave. Add in the seven he was on the concussion DL, and that is 16 games Perez was not available. 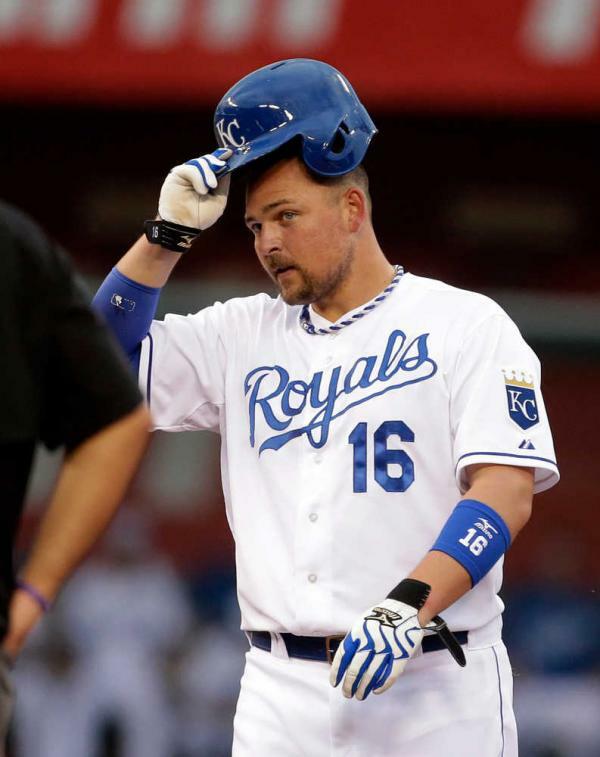 The Royals have played 118 games so far this year, so he has missed a total of 23 games. So there are games that he didn’t come in as a defensive replacement, but not very many. 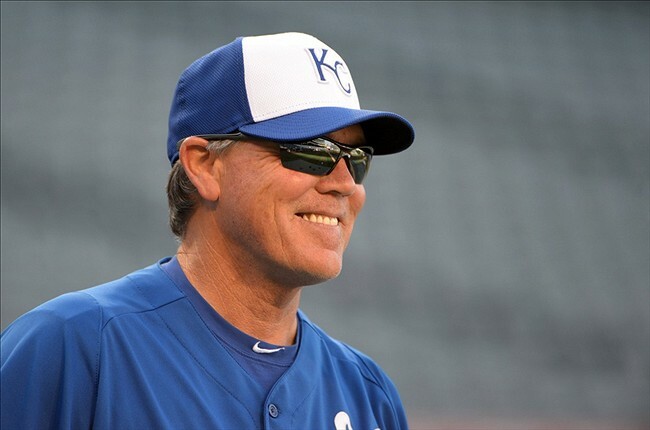 What befuddles my mind more than anything is that his manager, Ned Yost, was a former big league catcher. It is very well known within baseball that a catcher needs more days off during the season than a regular position player. A catcher squats a ridiculous amount of times in a game and the up and down movement wears a player down after awhile. So it would make sense that if your manager was a former catcher, they will take care of you and give you the extra time off you need. But Yost doesn’t seem to follow this philosophy. Perez isn’t the first catcher that he has attempted to run into the ground. Anyone remember Jason Kendall in 2010? Kendall played so much that year that I forgot backup catcher Brayan Pena was even on the roster. He had to be collecting dust and cobwebs as he watched Kendall play day after day. If it wasn’t for an injury late in the year that ended Kendall’s career, who knows just how many games Pena would have actually gotten into. For a guy who spent his career behind the plate, it sure seems like he’d rather run his catchers into the ground and say ‘to hell with the future’. For a team of youngsters, that just makes no sense to me whatsoever. 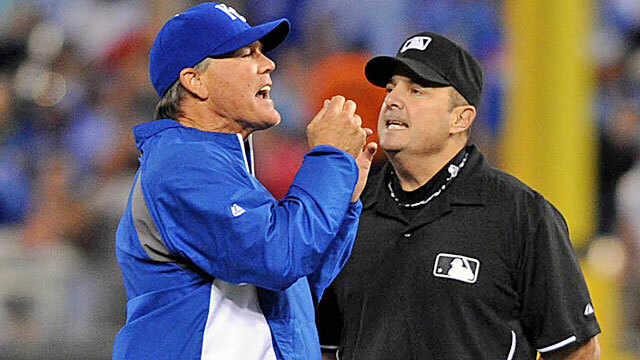 To me, Yost should know when is a good time to rest his pitch caller and when not to. It seems weird that I am preaching the case for resting a 23 year old catcher who is in only his third big league season, but I am. The Royals have Perez locked in for possibly the next six years, so this is an investment they should be taking care of. It’s a proven fact that tall catchers just don’t hold up as well to the rigors of catching duty on a daily basis the way a shorter catcher does. Just look at guys like Ivan Rodriguez and Yogi Berra as the cases for the short catcher. Hopefully Yost wises up within the next month and gives Perez some extra days off. The Royals could fall out of playoff contention sometime in September and if that happens, it would be as good a time to give more starts to Kottaras or even a Brett Hayes if he is back on the roster at that point. Unfortunately, you have to baby your catcher a bit more than say, your outfielders. If that means giving a guy like Salvador Perez an extra day off from time to time, you do it. Trust me, in six years you’ll be glad it was done. There is a famous line from the Neil Young song ‘Hey Hey, My My’: “It’s better to burn out than to fade away”. In the case of Perez, I hope we don’t find out whether that is actually true. 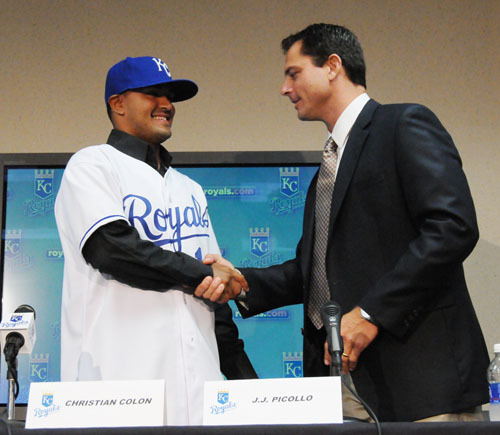 Christian Colon was the 4th overall pick of the 2010 Major League Baseball Draft by the Kansas City Royals and seemed like a sure bet to be the Royals second baseman of the future at the time. It seemed by this point he would be with the team, as the prevalent thought was he was farther advanced because of him playing in college and not needing the same kind of time a high school player normally gets. But as of today, Colon not only hasn’t set foot in the major leagues, he isn’t even assured that will happen anytime in the near future. So how did Colon go from a ‘sure thing’ to a giant question mark? Fullerton shortstop Christian Colon has been, in the scouting vernacular, “a guy” since he was a high school senior, when he was one of the better players on the summer showcase circuit but went to Fullerton due to signability and concerns about whether a player as slow-footed as he is could play shortstop in pro ball. Since then he’s established himself as a likely first-rounder in 2010 because he has shown he can play the position despite his lack of foot speed – he’s a 30 runner – with good range and great hands to make up for the lack of quickness. 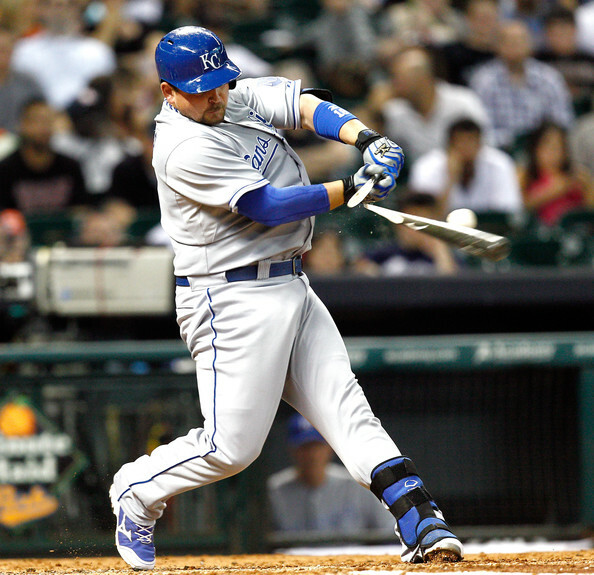 At the plate, Colon is usually pretty short to the ball with below-average power and a sound approach, although he occasionally gets into trouble when he lengthens his swing to get coverage on the outer half, at which point he’s more likely to hit the ball in the air instead of spraying the field with line drives. Whenever coaches and scouts talk about Christian Colon, they invariably start and finish with praise for his baseball IQ, instincts, leadership skills and confidence. Colon is just a darn good baseball player, they’ll say, a born winner who simply finds a way to get the job done. Amidst the kudos for Colon’s intangibles and makeup, it’s easy to overlook his talent, and his production. A second-team All-American as Cal State Fullerton’s sophomore shortstop this spring, Colon ratcheted his game to another level this summer, hitting .362/.459/.617 and leading Team USA in slugging, home runs (five), RBIs (37), runs (31) and stolen bases (24 in 26 attempts). He also drew 11 walks and struck out a team-low six times despite registering a team-high 94 at-bats. For his impressive offensive production—and, yes, for his valuable leadership—Colon is Baseball America’s Summer Player of the Year. Colon is a spray hitter, with ability to make consistent contact and hit to all fields. He doesn’t have much power, though he has shown the ability to hit the gaps on occasion. His pure speed grades out as average or a tick below. Colon makes the most of what speed he does have with good base-running instincts. He has an above-average arm at shortstop. Colon is a very sure-handed and reliable middle infielder. There are other shortstops with better range, but Colon makes all the plays. Colon earns the compliment of being termed a real “baseball player” because of his fine instincts on the field. His bat and lack of projection. Colon is solid in all aspects of the game, but doesn’t have a tool that truly stands out. So from all of that, it seemed his lack of foot speed could be made up by great hands, good range and a splendid baseball IQ. This isn’t really praise that baseball experts throw around to just anybody, and the pick seemed to be one to help the very near future for the Royals, when Dayton Moore believed they would be competing(before Moore changed his mind on just how long the ‘Process’ would actually take). He might not have panned out to be an All-Star, but the overall consensus was that he would be a productive major leaguer that would play pretty good defense and be a solid hitter. Now, that all sounds okay, especially with the second base carousel we’ve seen in Kansas City the last couple seasons. 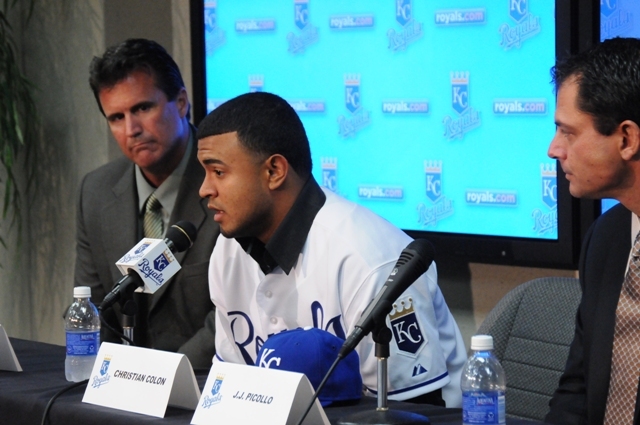 But here is where part of the problem lied: this was the Royals first round pick at #4. NUMBER 4!! Here is just a sampling of who was picked after Colon in the 2010 draft: Matt Harvey(7th pick), Yasmani Grandal(12th pick), Chris Sale(13th pick) and Christian Yelich(23rd pick). Obviously, out of those four that have reached the majors, Harvey and Sale will make someone wince at would could have been. The existing thought at the time was that the team needed middle infield help and Colon would be a fast rise to the big leagues. I’ve always been a proponent of picking the best player, in spite of if that spot is filled at the big league level, as you can always move the player to a different position or use that player as trade bait. Hell, you could sour on the initial person and end up trading them to make room for the prospect. The point being you shouldn’t draft by need as much as who is the best player available. Colon seemed like a fine draft pick, just maybe not one at #4. Yes, it is made worse by Harvey and Sale having the success they have seen the last few years. But if you go by all the scouts and experts, we should have seen Colon already. Instead, we are not only waiting, but also wondering if we will ever see him at all. He’s a skilled hitter who hits behind runners, bunts and executes the hit-and-runs effectively. Defensively, Colon’s range is limited, and his speed and arm are below-average for a shortstop. He does exhibit fluid and quick fielding actions and his playmaking ability is outstanding. His frame offers little room for projection, and offensively he can be streaky. For scouts who focus on what he can do, his tremendous hands and footwork, as well as his bat control, make him a future big league regular, best suited as an offensive second baseman. Now, you can see that they seem him as a big league regular. But there is one little addition to this that is forgotten. Colon finally had a breakout offensive season in 2012, where he played mostly in AA Northwest Arkansas. The problem is that everyone seems to have great seasons for NW Arkansas. It is in the notorious Texas League, which has always been an offensive league. So yes, he did have a good 2012 that helped elevate his standing. But how much of it is factored on the league he played in? I think it plays a factor, but these last few weeks have made things a little more questionable. 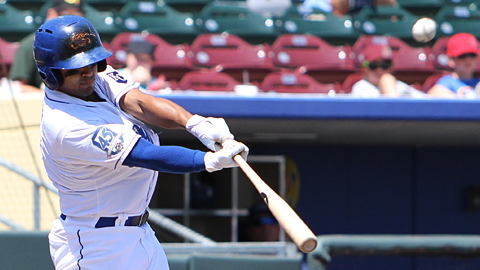 Colon has gone on a hot streak at AAA Omaha, yet his average sits at .266 with an OBP of .325. Obviously, he had been slumping so badly that even a big burst has only put his stats at average or respectable. Maybe it is adjusting to a new level, which is very possible. It’s also possible that this is just the player he is, which is average. 2013 has been the first season where he has been playing at second base on a full time basis(he played there a bit last year, gearing him up for this year), which could also play a bit into it. 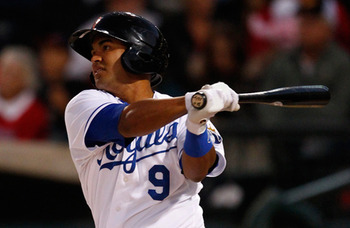 None of his numbers really jump out at you, which has to be of major concern for Royals management. To even go a step further, Johnny Giavotella has great minor league numbers yet can’t seem to latch on in the big leagues. The difference? Gio wasn’t a #1 draft pick. Because of that, Colon will be given every chance in the world to succeed, unlike Giavotella’s lack of real chances. So if I looked into my crystal ball, what do I see in Colon’s future? 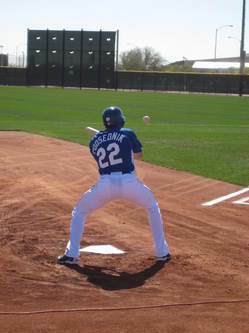 I think the Royals are going to give him every chance in the world to win the second base job come Spring Training 2014. I think there is a very good chance he will win the job, if for no other reason than what the other options look to be(Getz, Carroll, Giavotella, etc.). It’s obvious that the Royals have soured on Colon at least a bit, as you would think with the way he is hitting right now he could see a call up to the big club to fix the black hole at second base. Instead, they are content with calling up Irving Falu, acquiring Jamey Carroll, and playing 84 year old Miguel Tejada at the position. I have a feeling when it is all said and done, Colon will have a long major league career, but mainly as a back-up infielder. As much as Dayton Moore has had many a success with his first round picks since he became general manager of the Royals, Colon would be his one misfire. You just don’t spend a first round pick on a backup infielder. I hope I am wrong about this and Colon becomes a mainstay for the Royals for a long, long time. But the odds don’t look good. It just goes to show you that the biggest crap-shoot in sports is the Major League Baseball draft. You can think you have a sure thing when you couldn’t be farther from the truth. Right, Brien Taylor? When events happen the same they always do, year after year, it’s easy to recognize them, curl up next to them and wrap yourself in it’s comfortable blanket. It’s easy to fall back on old vices; they are familiar and you know how to deal with them and what’s coming next. But when things go awry…well, then it’s hard to know how to react. 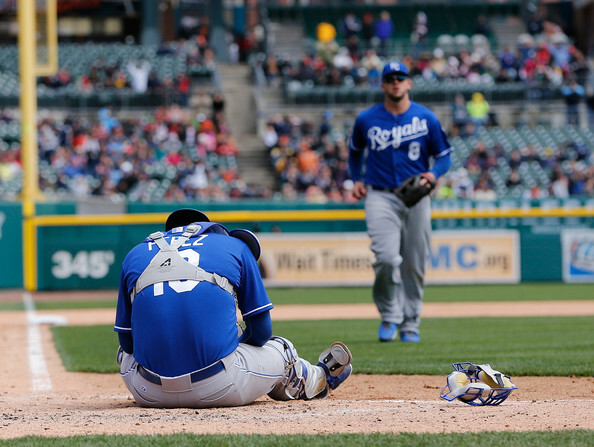 That’s why the way the Kansas City Royals are winning has been hard to just embrace. It’s not just that they are winning; no, it’s that they are doing it convincingly and trying to make even the most bitter of us fans smile again. 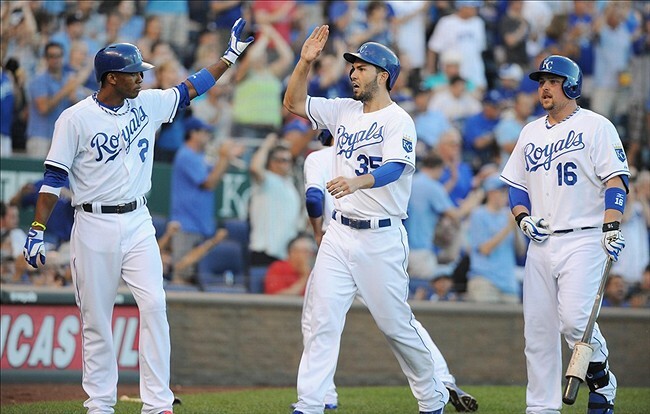 The Royals limped into the All-Star break, not giving us fans much hope that good times were just around the corner. No, in fact the opposite happened. After a hot April, a putrid May, and a better June, it was hard to tell just what we should expect from this team. Were they the team that made it look easy early in the year? Or the team that couldn’t hit the side of a barn if plopped right in front of said barn? The team who’s pitching was amazing early on? Or the team that forced the team to bring George Brett in to help the offense because everything else hadn’t worked? This team was all over the place, to the point I wanted to re-name them ‘Sybil’. So when General Manager Dayton Moore said this team could go on a tear and win 15 of 20, we laughed. We mocked. We snarked. We did everything but believe they could actually do that. But they did it, and in the process completely turned this season around. Not only have they played better than 15-5, they are at 16-4 since the All-Star break and looking to win again as I write this. How have they been doing it? Well, it’s more than just one thing or another. Early on, the pitching was carrying the team. It’s no surprise, really, as the pitching has been a plus for this team all year, but when you have a few clutch hits, out comes an 11 game winning streak. 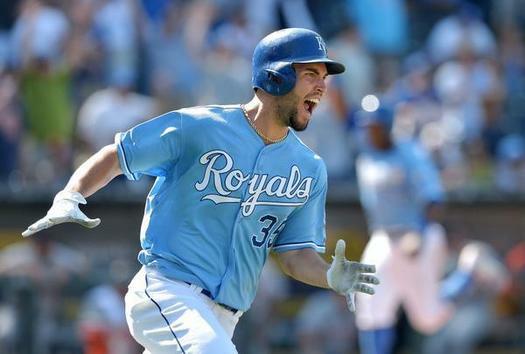 Since June, Eric Hosmer has been red hot and looked more like ‘Rookie’ Hosmer than the abomination he was last year. Mike Moustakas flat out sucked in the first half, but so far in the second half he is hitting over .300 and found his power swing. But there’s more; Alex Gordon seems to be coming around, Billy Butler is picking it up, and Miguel Tejada doesn’t look like the 84 year old that he is. This team has started to hit and be a threat whether they are playing the Twins or the Red Sox. I’ll even admit, I was probably a ‘Negative Nelly’ when this streak started. Not only did I not think they had it in them, I was angry about a move that occurred right before the second half. 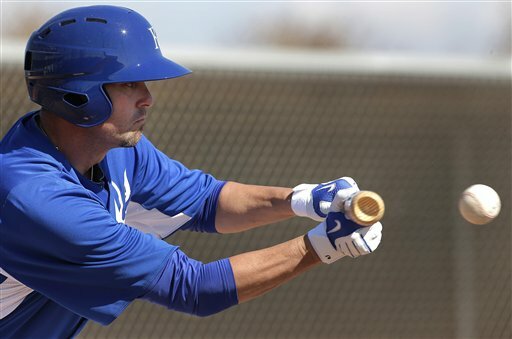 Royals management(read: Moore) said that when Johnny Giavotella was called up that he was going to be given a chance to win the second base job. As Royals fans, we had heard that before, and we thought the worse. But it was almost worse than even we could have imagined. 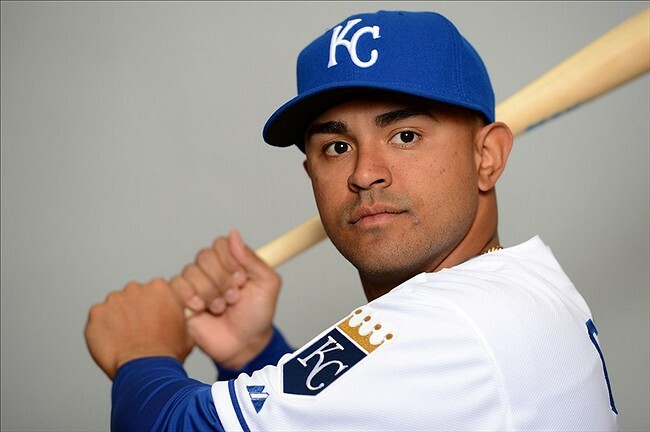 Gio lasted ten games(those that he actually played; a number of games he was benched in favor of Tejada or Elliot Johnson) and 38 plate appearances before being sent down and (ugh) Chris Getz was called back up. Again. Look, it wasn’t even about Getz being called back up, although let’s be honest, it felt like they just weren’t getting why he WASN’T a real option. Getz is what he is. No, the problem was more being lied to by management about Giavotella being given a chance. So, I didn’t watch any games. To be 100% honest, I was pretty stress free during those first seven games or so. 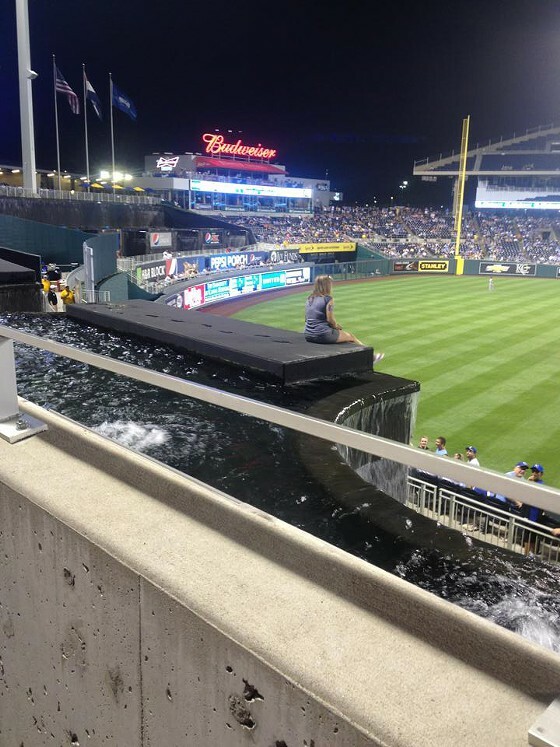 The Royals were winning, but I just couldn’t enjoy it, even if I had wanted to. Then one night, the light bulb went off. Sure, I didn’t agree with management. Sure, I wanted Moore and manager Ned Yost fired, that wasn’t going to change. But all I’ve wanted the last 18 years is for this team to win again. Deep down, I wanted to have fun watching MY TEAM play ball rather than feel bad about how much they sucked pond water. The Royals were winning, and I was missing it! So, I tucked my pride away, tucked all the anger in the closet and started watching again. What a saw was a fun baseball team, a team that played with boundless energy and determination. This is a young team that doesn’t realize they shouldn’t be playing this good. They don’t realize the big bad Tigers in their division are playing EVEN BETTER, yet the Royals still go out there and win. At the end of the day, they are doing the one thing all of us longtime Royals fans have wanted to see: winning. So now is as good a time as any to ask the question we are all wondering; is this team for real? Or more importantly, can they keep it up? I have no clue. The funny thing about baseball is that it never really follows a continuous pattern. Some things in the game just defy logic and you just have to go with it. 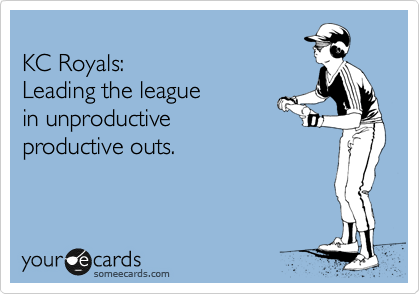 As Royals fans, that’s what we should be doing. Just enjoy the winning and hope it continues. I know there was a lot of talk in the off-season that this team would contend for the playoffs, but most of us thought a record right around .500 was more realistic. The Royals are now 4.5 games out of the second Wild Card with right around 50 games left. Weirder things have happened, folks. It would be fabulous to finally have October baseball in Kansas City again. It’s what we all have yearned for. But even if it doesn’t happen, let’s all just promise each other one thing. Let’s just promise to enjoy every win. Because we are officially in uncharted territory. I don’t know about you, but I don’t know how to act. 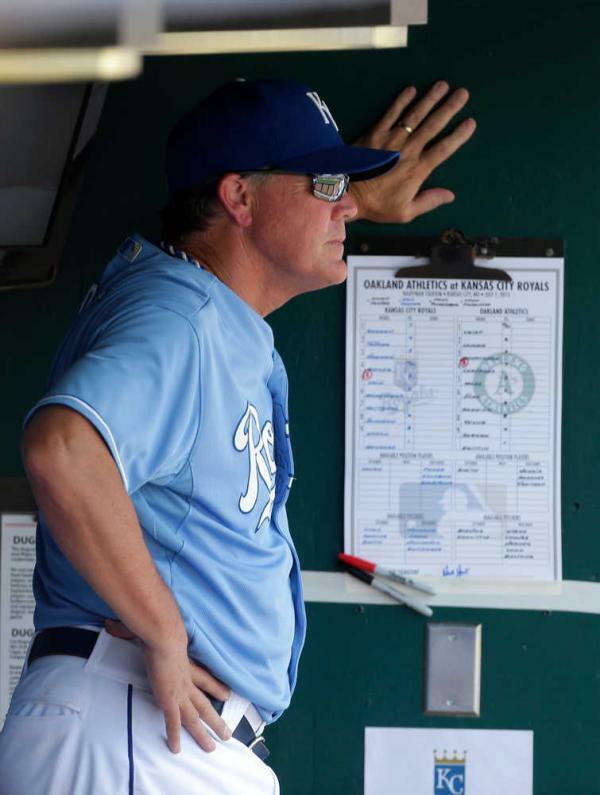 The Kansas City Royals are over .500 and are just 4.5 games out of a wild card spot, so I felt it was time to check in with Royals skipper(and Foxworthy enthusiast) Ned Yost and let the fans ask him some questions about our boys in blue. Now, normally this spot is reserved for Royals sometime second baseman(and bunting expert) Chris Getz. Getz, though, is in Omaha on rehab assignment, so Yost will be taking the reigns today(or at least how I think he would answer). So here we go–Questions with Neddy! Well Craig, I’ve been around this game a long time, and I’ve never seen a catcher like Salvy. He is really special. But as a former catcher, and one who rarely got into games, I would think a catcher would want to be in the middle of the action as much as possible. 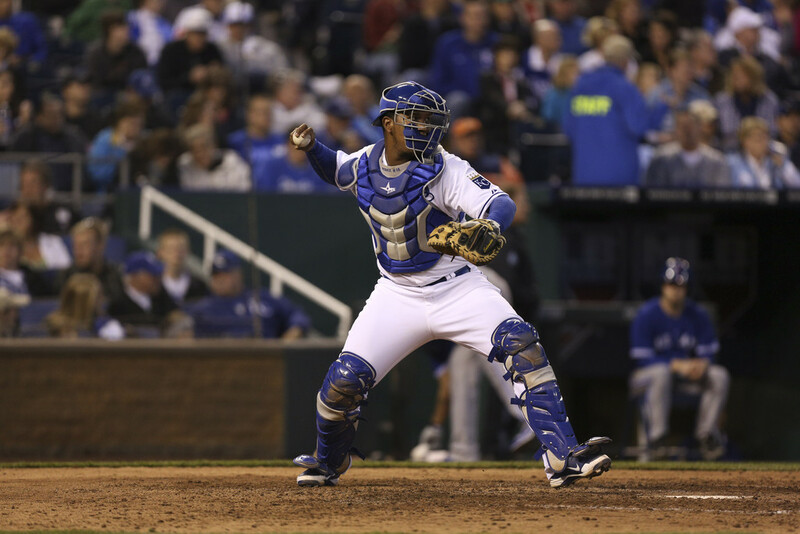 Having Salvy behind the dish makes our team better and puts us in a better position to win. So, to answer your question, I’ve never overworked a catcher and I will really give him a day off. Except if we really need him in the game. Or have a lead. Or our pitchers ask nicely. Or if Kottaras walks too much. But yeah, I’ll totally give him a complete day off if needed. Every closer goes through their ups and downs. It’s not like closers grow on trees that you can just pluck them from. Holly struggled early on in the year, but I always had faith in him and knew he could come around and be as good as he has been. It’s as much about confidence as going out there and throwing strikes or throwing it to where the hitter doesn’t hit the ball. Holly never really gave me a reason to doubt him. So, no, I didn’t know he would be this dominate. It was so hard to send Getzie down, Lee, because the clubhouse loves him so much and he is just such a great player. He wasn’t really struggling too much, but he had options so we used one. It had nothing to do with performance. We hope to see him back here soon, as we really need that extra punch in the lineup. Miggy is doing a fine job at second, way better than Gio was doing during that long stretch of ten games he played in. But having Getzie in the lineup gives me another weapon and gives me the opportunity to really show everyone how a real bunter can bunt. Well, bunting is not only a real weapon, but also an art. When one of our guys lays down a good bunt, I get goosebumps and get a warm feeling in my pants. There isn’t a more exciting play in the game than a solid, hard bunt to move a runner over. As to your other question, I realize it’s not 1982, but the game never changes. Playing for one run is always a wise strategy. Especially when you have guys like Getzie, Esky, and Dysey at the plate. It’s not like 1982 was really that long ago. I always had faith in Moose and what he could do. He just needed half a season and a Hall of Famer to give him a kick in the pants. You know, these things don’t just happen overnight. These youngsters need time to grow, time to get comfortable and time to find out what works for them. Maybe if our fanbase would have more patience they would understand that. I mean, have they ever shown any patience in this franchise? I mean, it’s not like there’s been mostly bad baseball in Kansas City for close to twenty years, has there? Moorey has really put together a great bunch of guys. He’s given me guys like Getzie, Esky, Salvy, Holly, Hos, Moose, and lots of other guys with great nicknames. Hell, I really hoped Frenchy could have stuck around, but it made sense that the Giants needed him more than we did. I really miss him walking around the locker room in his jock strap. Dayton has just put together the best bunch in the world that perform at a higher level despite my shortcomings. Plus, he always has cool sunglasses. Both of those guys have great stuff and I really feel like in a perfect world we could put Hoch back in the rotation again. Wade seems just like Hoch, he seems like he is almost there and he’s just about to really turn the corner and become a top starter. I don’t see any reason to take Wadey out of the rotation. He has had some good starts, that is for sure. I really think he could be a top starter. Really, he was a steal in that Myers trade. In reality, we probably could have traded Myers straight up for Wadey. That’s what I would have done. We miss you too, Getzie. Don’t worry, I’ve made sure to postpone bunting drills until you get back. It’s just not the same without our expert bunter. Get healthy and we’ll get you back here in no time! I’ve always said the next time I am wrong will be a first, but I can’t really share my secrets. I can tell you bunting is a big part of it. Hey, aren’t you the guy stalking Getzie? I’ve heard about you. Maybe you should leave us alone and let real baseball people break down the game. Don’t make me add my name to Getzie’s court order against you! So there you are. Big thanks to Royals manager Ned Yost for taking the time to answer all these questions. Hopefully the next time Getzie can be back and answer all of your wonderful questions. Until next time, keep on winning, Royals!